“Don’t waste a day wondering what if.” (Page 88). From the Wreckage is a book that explores the above quote. 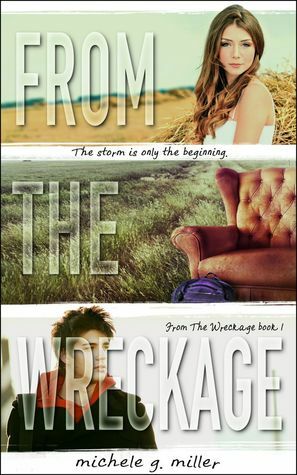 For Texas teen Jules Blacklin, everything changes in one day when a natural disaster tears her small town apart. Her life is turned topsy turvey following the tornadoe’s wake. She has lost one of her best friends. Her town has a lot of recovery to go through. Her school was decimated. The aspect of her life that changed the most; however, was realizing that it isn’t worth it to stay in a relationship that isn’t the same anymore and that she shouldn’t put off her own happiness. This book throttled me as hard as the tornado devastated Jules’ town. The description of events leading up to and during the tornado were like a scene from the classic movie Twister. I was on the edge of my seat and my eyes were wide with the tension. The author really does capture the emotional upheaval and turmoil that goes along with escaping the clutches of a disaster. And this was less than a quarter of the way through the novel. How could it get more tense? How could there be more excitement? Well, there wasn’t. Michelle Miller climaxed less than 25% through the novel and spent the rest of the plot and character development in limbo. It was like if I stay by Gayle Foreman, where you’re waiting for the big punch, only to be disappointed by the almost lackluster and anticlimactic ending. Miller set herself up for this when she gave away her big emotional roller coaster so soon. The rest was just the aftermath. I thought the book could have been shorter. After all, how much resolution can there be after a climax so soon? Still, I wasn’t disappointed entirely because the novel fits quite well into young adult literature, giving me all the angsty teen drama I could want. I just wish it hadn’t been preempted so soon with such a whirlwind beginning. For this unequal pacing I was annoyed, but not too much because I loved Miller’s writing style and how she painted her characters. This book wasn’t about the action so much as about the characters. It was fascinating to watch Jules go through her own stages of grieving and loss. Her conflicted thoughts on her relationships with both the football star and West Rutledge were the highlight of the book in my mind. The second major nuisance of the novel was the way Miller presented the story. It was told mainly through the narrative of Jules herself, as she tells the story for the video documentation of the high school seniors. This is so annoying and unnecessary that I skipped almost all the parts where Jules is in the present commenting on the past. The second major nuisance of the novel was the odd sounding tense used (third person present). It was jarring every time I picked up the book and made the entire thing difficult to read on a sentence by sentence basis. For these two reasons alone this book will never be a five-star book, at least in my opinion. If the story is in the past, let it be in the past and don’t pull us out of the narrative to let us know Jules is sad again in the present. Let the story tell itself! Still, if I had noticed these errors before I had begun reading, would I do it again? Yes, because the story was interesting, the characters were fascinating, and the emotions were real. This novel was published by Enchanted Ink Press June 11th, 2014 and is available on Amazon here.